PLAYM8 ® 5 A Day Beanbags. Bean Bags with a difference! This set of brightly coloured PVC beanbags are strong and durable and can be easily wiped clean. 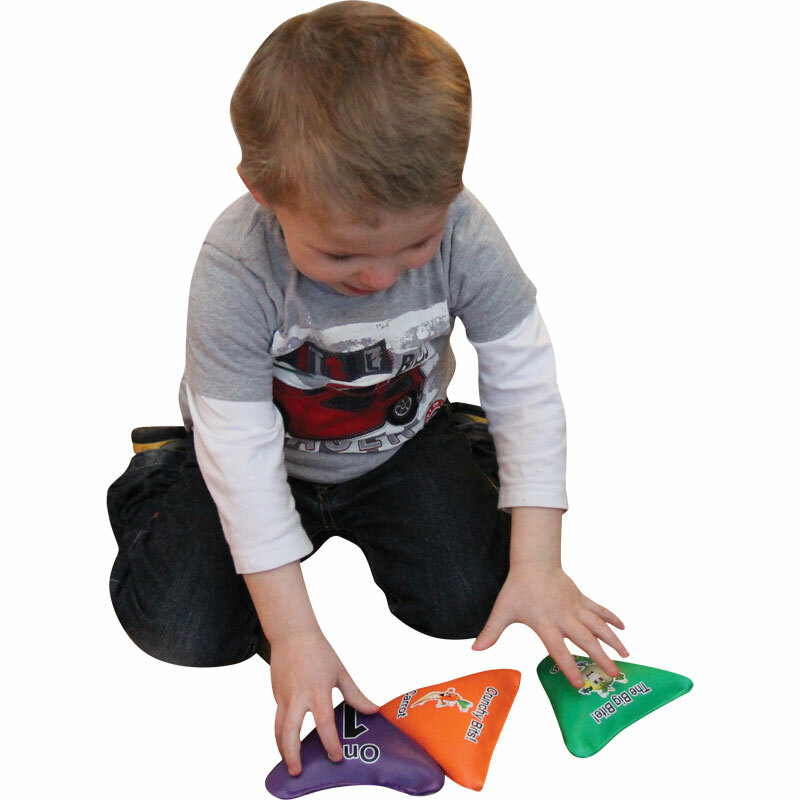 Each triangular beanbag has a 5-A-DAY friend printed on one side with a number on the reverse ranging from 1 – 5, making the play and activity opportunities and games endless and engaging for everyone. Designed specifically for early years, (ages 2-5), the children love them and it helps them on a healthy pathway through encouraging them to eat their greens in a simple, fun yet effective way! The concept of 5 A Day is based on the government’s recommendation of eating 5 variants of fruit and vegetables a day in order to live and maintain a healthy lifestyle leading to all round benefits. Fruit and vegetables are part of a balanced diet and can help us stay healthy. That’s why it so important that we get enough of them. 5 A DAY is based on advice from the World Health Organisation, which recommends eating a minimum of 400g of fruit and vegetables a day to lower the risk of serious health problems, such as heart disease, stroke, type 2 diabetes and obesity. Taking all of this into consideration, teamed with the government recommendation that cchildren under five who can walk unaided should be physically active every day for at least 180 minutes (three hours), spread throughout the day, indoors or out, the 5 A Day product and resource range was developed. 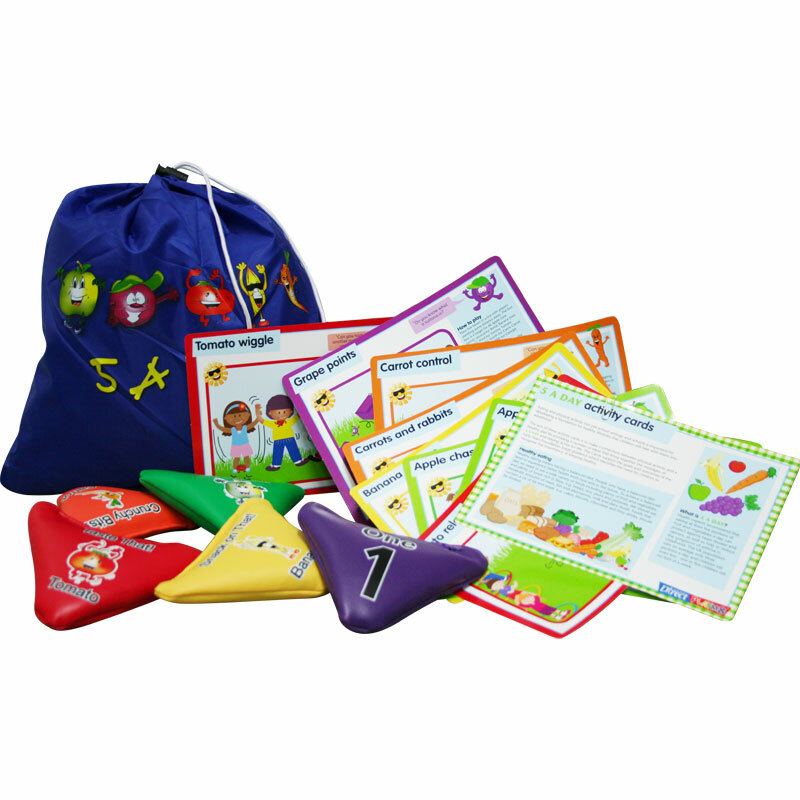 PLAYM8 ® 5 A Day Beanbags and Cards, pack of 9 beanbag resource cards containing three fun activity ideas for each of the 5 A Day friends which can be played with either the 5 A Day latex characters or 5 A Day beanbags. These activities will help reinforce the message of healthy eating, build literacy and numeracy while having fun. Cards: A5 size, 8 double sides and 1 single sided.